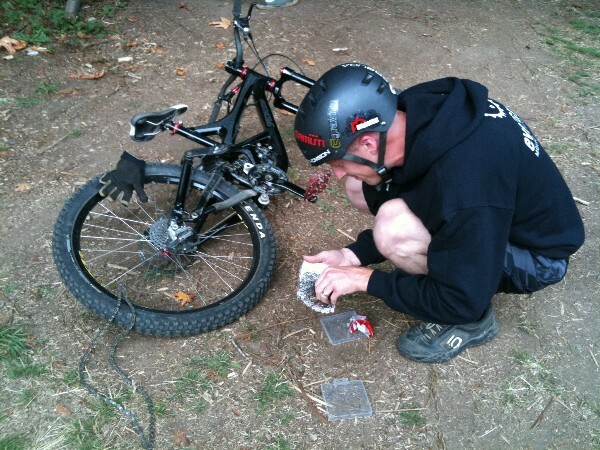 The Puget Sound region’s leading mountain bike club, the Evergreen Mountain Bike Alliance, is undergoing some Obama-like “change you can believe in” as a result of membership turmoil we reported on last month. The latest shocker: Executive director John Lang is resigning as of Sept. 1. Lang’s arrival in the spring of 2008 marked a sharp change of direction for the organization then known as the Backcountry Bicycle Trails Club. Lang put a stamp of professionalism on the club, liaisoning it with other user groups and forest administrative agencies while also shepherding mtb projects like Colonnade (a huge publicity win for the club), Paradise Valley and Duthie Hill. But Lang is not a mountain biker, a factor that led him to become a lightning rod for discontent over club policies starting with the surprise name change (which was under way before he took office). He also failed to communicate with the membership, which saw him as detached and aloof, even as his political acumen made measurable progress with previously antagonistic or uncooperative sectors. We at BikeIntelligencer believe Lang was making the right moves, but without buy-ins from the membership. A better communicator would have explained what he was up to and done the political spade work to create ownership at the member level. The turmoil within Evergreen comes at a strategic juncture for the sport of mountain biking. Even as the sport explodes among youth, especially teenagers, agencies and other trail user groups are expressing concern over the growth in unauthorized (again, we avoid the term “illegal” as inapplicable in trail administration) construction and riding. In Canada there is no problem, so the kids (groms) watch the DVDs and go to Whistler and NorthShore and see what’s possible and want it in their back yards. They don’t know how to work the system and in any case do not want to wait for bureaucracy to act. In the meantime, veteran mtbers take the heat from their trail peers for things they have nothing to do with (but may wholeheartedly support! ); like what adult ever stopped kids from building things — treehouses, forts, skateparks and so on down the line. Thus “advocacy” becomes the stepchild of “recreation,” creating a dualistic mission for a group like Evergreen. It all sets the stage for a lively “Town Hall” summit meeting on Tuesday, September 1 at Duthie Hill near Issaquah. It looks like there will be riding before and/or after, as well as a barbecue and festive atmosphere to keep the mood upbeat and positive. See you there!